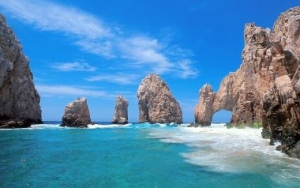 Cabo is a varied destination that captures the essence of Baja Peninsula in its many resorts, hotels, golf courses, dining and amazing outdoor activities. Cabo San Lucas is a bustling hub for sport fishermen, cruise ships, handicraft vendors, water sport aficionados and nightlife seekers. The area is considered the second fastest growing resort destination in all of Mexico and particularly busy with visitors during the winter high season, November to February. With some of the best all-around sport fishing in the world and every water sport imaginable, Cabo is the ultimate destination for travelers looking for outdoor adventure.